Western Digital Green 120GB M.2 SSDs boost the everyday computing experience in your desktop or laptop desktop PC for fast performance and reliability.You can browse the web, play a game, or simply start your system in a flash.It is the lowest power consuming drives in the industry with less power used in your laptop runs longer. Western Digital Green 120GB M.2 SSD is help to keep your data safe from loss in the case of accidental bumps and drops, using no moving parts. This SSDs are available in 2.5” 7mm and M.2 2280 models for simple, worry-free upgrading.In this SSD, it provides 120GB capacity with SATA 6Gb/s interface with 03 years warranty. 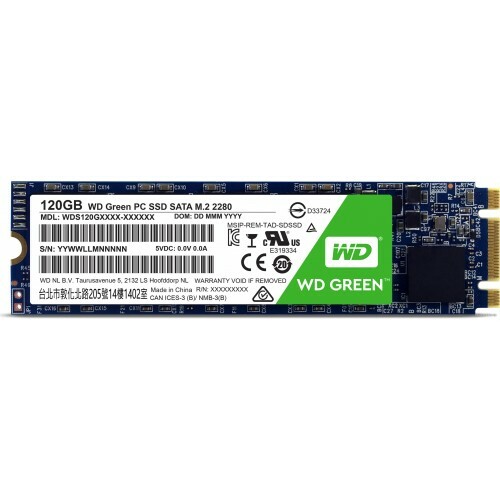 Purchase Western Digital Green 120GB M.2 SSD at best price in Dhaka, Rangpur, Chattagram, Khulna & Sylhet with quality expert solutions. Now you can shop online and have the delivery of your M.2 SSD at any destination in Bangladesh.